Golf carts are made to be durable. Customized golf carts are even more durable – they’re designed for specific jobs and environments. 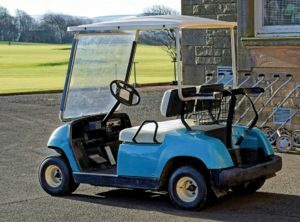 When you work with businesses or customers who’ve owned golf carts before, they’ll be very familiar with the durability of certain parts, and what may need a replacement in the near future. In fact, you can use golf cart parts replacement to help close a golf cart sale. Lets go through some of the parts that are replaced most often. Think about how can you use these to help close that cart sale. This will be the most commonly replaced part for electric golf carts. Some dealerships provide used golf cart chargers, even with new carts. We’d say this is one place where dealerships can earn some easy trust. New chargers will last longer and be healthier for the golf cart’s durability. Rather than coming down in price on customized golf carts, stress the importance of a new battery charger and include it at a discount or as a freebie. Focus on how this will make the cart itself last longer. Businesses that deal with multiple golf carts may be especially keen on this. Golf cart windshields can earn pock marks and scratches without wearing down. They’re very durable. Golf carts used in extremely rocky terrain and for off-roading will see more windshield cracking than others. Stones and pebbles get kicked up often. Not all golf carts need a windshield, but for those in rockier environments it’s a must. Off-road golf carts should include windshields, too. Drivers won’t always see low-hanging branches and not having a windshield can be dangerous. You can offer free windshield replacement to help incentivize a sale. Off-roaders like hunters, fishermen, and campers will love this. If you worry about it getting taken advantage of, you can limit it to a certain amount of time or number of replacements – it’s still a very good incentive for those who know they’ll need windshields protecting them. For similar safety reasons, brakes will get worn quickly. It’s much, much easier to change brakes on a golf cart than a car, so you can help close a deal by offering free brake replacement or – if the customer wishes to replace them themselves – free brakes when the time comes. Batteries eventually wear down. When this happens, golf carts will take longer to charge and they’ll lose power more quickly. The batteries themselves may show damage, and the golf cart won’t perform quite as well as it once did. This is all solved with a replacement battery. If a customer comes in when they need a new battery, you can mark down that a purchase today means they’ll get that replacement free when the time comes! Businesses that put their golf carts through heavy duty will be especially appreciative of this. Lights aren’t always replaced because they wear out or burn out. Often, they’re replaced with better, stronger versions. This is important for businesses that may have older customers driving the carts, as well as off-roaders who need crystal clear night vision. You’ll notice that many of the inclusions you can offer on customized golf carts bring customers back into the dealership. This will help them see other new carts and accessories on offer. It’s a good way of giving the customer something valuable to help close a golf cart sale, and to encourage them to stop on by when they need new batteries, windshields, or brake replacements. It gives you a good reason to check in down the road. It helps customers stay in touch and to be satisfied with their golf cart’s performance and quick parts replacement over the long term. Even today, customers still find great value in relationships and good service. This helps with word of mouth, referrals, and continued business.